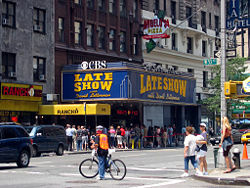 CBS's Ed Sullivan Theater in Manhattan, home to the Late Show with David Letterman. CBS is one of the largest radio and television networks in the United States. The name is derived from an abbreviation of Columbia Broadcasting System, its former legal name. The company became known as CBS, Inc. in 1971, and as CBS in 1997. One of the pioneer radio networks, from its earliest days CBS established a reputation for quality, due in no small part to the influence of William S. Paley who viewed broadcasting as communication of entertainment and information to the public, that public being the whole nation. His vision continues to guide not only CBS but the media in general. Prior to the fracturing of the market under cable television, the CBS television network was one of the "Big Three" which dominated broadcasting in the United States and is also shown on basic cable in Canada (the others being ABC and NBC). CBS can trace its origins to the creation, on January 27, 1927, of the "United Independent Broadcasters" network. Established by New York City talent agent Arthur Judson, United soon looked for additional investors; the Columbia Phonographic Manufacturing Company (also owners of Columbia Records), rescued the company in April 1927, and as a result, the network was renamed "Columbia Phonographic Broadcasting System." Columbia Phonographic went on the air on September 18, 1927, from flagship station WOR in Newark, New Jersey, and 15 affiliates. Unable to sell enough air time to advertisers, on September 25, 1927, Columbia sold the network for $500,000 to William S. Paley, son of a Philadelphia cigar manufacturer. With Columbia Phonographic's removal, Paley streamlined the corporate name to "Columbia Broadcasting System." Paley believed in the power of radio advertising; his family's company had seen their "La Palina" cigar become a best-seller after young William convinced his elders to advertise it on Philadelphia radio station WCAU. In November of 1927, Columbia paid $390,000 to A. H. Grebe's Atlantic Broadcasting Company for a small Brooklyn station, WABC, which would become the network's flagship station. WABC was quickly upgraded, and the signal relocated to a stronger frequency, 860 kHz. (In 1946 WABC was re-named WCBS; the station moved to a new frequency, 880 kHz, in the Federal Communications Commission's 1941 re-assignment of stations.) As the network's flagship, WCBS was where much of CBS's programming originated; other owned-and-operated stations were KNX Los Angeles, KCBS San Francisco, WBBM Chicago, WJSV Washington, DC (later WTOP), KMOX St. Louis, and WCCO Minneapolis.) Those stations remain the core affiliates of the CBS Radio Network today, with WCBS still the flagship, and all but WTOP (a Bonneville Broadcasting property) owned by CBS Radio. Later in 1928, another investor, Paramount Pictures Corporation (who ironically would eventually be co-owned with CBS), bought shares in Columbia stock, and for a time it was thought the network would be re-named "Paramount Radio." Any chance of further Paramount involvement ended with the Stock Market Crash of 1929; the near-bankrupt studio sold its shares back to CBS in 1932. As the third national network, CBS soon had more affiliates than either of NBC's two, in part because of a more generous rate of payment to affiliates. NBC's owner and founder of RCA, David Sarnoff, believed in technology, so NBC's affiliates had the latest RCA equipment, and were often the best-established stations, or were on "clear channel" frequencies. But Paley believed in the power of programming, and CBS quickly established itself as the home of many popular musical and comedy stars, among them Bing Crosby, Al Jolson, George Burns, and Gracie Allen. In 1938, NBC and the Columbia Broadcasting System each opened studios in Hollywood to attract top talent to their networks—NBC at Radio City on Sunset and Vine, CBS two blocks away at Columbia Square. In the hard times of the early 1930s, CBS radio broadened its offerings; having refused an Associated Press (AP) franchise for news, Paley launched an independent news division, shaped in its first years by Paley's vice-president, former New York Times man Ed Klauber, and news director Paul White. Another early hire, in 1935, was Edward R. Murrow, brought in as "Director of Talks." It was Murrow's reports, particularly during the dark days of the London Blitz, which contributed to CBS News's image for on-the-spot coverage. As European news chief and later head of the news division, Murrow assembled a team of reporters and editors that propelled CBS News to the forefront of the industry. As long as radio was the dominant advertising medium, CBS dominated broadcasting. All through the 1930s and 1940s, CBS programs were often the highest-rated. much-publicized "talent raid" on NBC in the mid-1940s brought Jack Benny, Edgar Bergen, and the Amos 'n' Andy show into the CBS fold. Paley also was an innovator in creating original programming; since broadcasting's earliest days, time had been sold to advertising agencies in half- or full-hour blocks. The agencies, not the networks, would then create the program to fill the time, thus it was "The Johnson's Wax Program, with Fibber McGee & Molly," or "The Pepsodent Show, with Bob Hope." At Paley's urging, beginning in the mid-1940s, CBS began creating its own programs; among the long-running shows that came from this project were You Are There (born as CBS Was There), My Favorite Husband (starring Lucille Ball; the show proved a kind of blueprint for her big CBS television hit I Love Lucy), Our Miss Brooks (whose star, Eve Arden, was encouraged personally by Paley to try out for the title role), Gunsmoke and The Adventures of Ozzie & Harriet. In time this idea was carried further, selling ad time by the minute, so that the agencies no longer had complete control over what went out over Mr. Paley's air. CBS was slow to move into television; as late as 1950 it owned only one station; radio continued to be the backbone of the company. But gradually, as the television network took shape, the big radio stars began to drift to television. The radio soap opera The Guiding Light became the first television soap when it began to air on CBS in 1950. Burns & Allen made the move in 1950; Lucille Ball a year later; Our Miss Brooks in 1952 (though it continued simultaneously on radio for its full television life). The high-rated Jack Benny radio show ended in 1955, and Edgar Bergen's Sunday-night show went off the air in 1957. But when CBS announced in 1956 that its radio operations had lost money, while the television network had made money, it was clear where the future lay. The last of CBS's daytime serials went off the air November 25, 1960, and prime-time radio ended on September 30, 1962 when a CBS offering, the legendary Suspense. aired for the final time. After the retirement of talk-show pioneer Arthur Godfrey in 1972, CBS radio programming consisted of hourly news broadcasts, occasional news features, and commentaries, and the nightly CBS Mystery Theater, the lone holdout of old-style programming. The CBS Radio Network continues to this day, but offers primarily newscasts and news-related features. The first CBS television broadcasts were experimental, often only for one hour a day, and reaching a limited area in and around New York City (over station W2XAB channel 2, later called WCBW and finally WCBS-TV). To catch up with rival RCA, CBS bought Hytron Laboratories in 1939, and immediately moved into set production and color broadcasting. Though there were many competing patents and systems, RCA dictated the content of the FCC's technical standards, and stole the spotlight from CBS, DuMont, and others by introducing television to the general public at the 1939 New York World's Fair. The FCC began licensing commercial television stations on July 1, 1941; the first license went to RCA and NBC's WNBT (now WNBC); the second license, issued that same day, was to WCBW, (now WCBS). CBS-Hytron offered a practical color system in 1941, but it was not compatible with the black-and-white standards set down by RCA. In time, the FCC rejected CBS's technology in favor of that backed by RCA. During World War II years, commercial television broadcasting was reduced dramatically. Toward the end of the war, the level of programming increased again, evident in the 1945-1947 period on the three New York television stations which operated in those years (the local stations of NBC, CBS and DuMont). But as RCA and DuMont raced to establish networks and offer upgraded programming, CBS lagged, advocating an industry-wide shift and re-start to UHF for their incompatible (with black and white) color system. Only in 1950, when NBC was dominant in television and black and white transmission was widespread, did CBS begin to buy or build their own stations (outside of New York) in Los Angeles, Chicago, and other major cities. Up to that point, CBS programming was seen on such stations as KTTV Channel 11 in Los Angeles, in which CBS—as a bit of insurance and to guarantee program clearance in Los Angeles—quickly purchased a 50 percent interest. CBS then sold their interest in KTTV and purchased outright Los Angeles pioneer station KTSL (Channel 2) in 1950, renaming it KNXT (after sister CBS radio station KNX), later to become KCBS. The "talent raid" on NBC of the mid-1940s had brought over established radio stars; they now became stars of CBS television as well. One reluctant CBS star refused to bring her radio show, My Favorite Husband, to television unless the network would re-cast the show with her real-life husband in the lead. Paley and network president Frank Stanton had so little faith in the future of Lucille Ball's series, re-dubbed I Love Lucy, that they granted her wish and allowed the husband, Desi Arnaz, to take financial control of the production. This was the making of the Ball-Arnaz Desilu empire, and became the template for series production to this day. In the late 1940s, CBS offered imaginative and historic live television coverage of the proceedings of the United Nations General Assembly 1949. This journalist tour-de-force was under the direction of Edmund A. Chester, who was appointed to the post of director for news, special events, and sports at CBS Television in 1948. The broadcast clearly underscored CBS's long term commitment to excellence in broadcast journalism in the post-World War II era. As television came to the forefront of American entertainment and information, CBS dominated television as it once had radio. By the late 1950s, the network often controlled seven or eight of the slots on the "top ten" ratings list. This would continue for many years, with CBS bumped from first place only by the rise of American Broadcasting Company (ABC) in the mid-1970s. Perhaps because of its status as the top-rated network, during the late 1960s, and early 1970s CBS felt freer to gamble with controversial properties like the Smothers Brothers Comedy Hour and All in the Family, and its many spinoffs during this period. William Paley was a buyer of art, and a backer of New York's Museum of Modern Art. CBS offices were filled with original works. Paley shared this interest with Frank Stanton, CBS President (1946-1971), who carried this belief over into the design elements surrounding the network. When CBS bought Los Angeles station KNX in 1936 for a west-coast production headquarters, Frank Stanton demanded that architect William Lescaze be hired to create Columbia Square, a distinctive, modern broadcasting center on Sunset Boulevard. Similarly, when CBS commissioned Eero Saarinen to design a new corporate center in New York in the 1960s, Stanton supervised every aspect of the project, even dictating what could be displayed in employee offices and on desktops. This belief in art, graphics, and branding carried over to such things as the CBS Television's logo, the unblinking eye logo (designed by William Golden and introduced in 1951). An example of CBS's graphic-design particularity: on all official CBS letterhead, a tiny dot (at most a point in diameter) was pre-printed to indicate to a secretary where the typewriter carriage should be positioned for the salutation of a letter. Although CBS-TV was the first with a working color television system, it lost out to RCA in 1953, due in part because the CBS color system was incompatible with existing black-and-white sets. By the early 1960s, CBS-TV was void of transmitting anything in color—save for a few specials and only if the sponsor would pay for it. Color was being pushed hard by rival NBC. Even ABC-TV had several color programs in 1962, where CBS-TV had none. One famous CBS-TV special made during this era was the tour of the White House with First Lady Jackie Kennedy, whose always colorful outfits came off looking drab in CBS' grayscale. This would all change by the mid-1960s, when market pressure forced CBS-TV to add color programs to the schedule. By 1966, all of CBS's TV programs were being shown in color, as they were on NBC and ABC. During the 1960s, CBS began an effort to diversify, and looked for suitable investments. In 1965, it acquired electric guitar maker Fender from Leo Fender, who agreed to sell his company due to health problems. Forming the CBS Musical Instruments division, the company also acquired Steinway pianos, Gemeinhardt flutes, Lyon & Healy harps, Rodgers (institutional) organs, Gulbransen home organs, Electro-Music Inc. (Leslie speakers), and Rogers drums. The last musical purchase was the 1981 acquisition of Arp Instruments, developer of electronic synthesizers. Between 1965 and 1985 the quality of Fender guitars and amplifiers declined significantly. Encouraged by outraged Fender fans, CBS Musical Instruments division executives executed a leveraged buyout in 1985 and created FMIC, the Fender Musical Instrument Corporation. At the same time, CBS divested itself of Rodgers, along with Steinway and Gemeinhardt, all of which were purchased by Steinway Musical Properties. The other musical instruments properties were also liquidated. In other diversification attempts, CBS would buy (and later sell) sports teams (most notably the New York Yankees baseball club), book and magazine publishers (Fawcett Publications including Woman's Day, and Holt, Rinehart & Winston), map-makers, toy manufacturers, and other properties. It made a brief, unsuccessful move into film production in the late 1960s, creating Cinema Center Films; this profitless unit was shut down in 1972; today the distribution rights to the Cinema Center library rest with Paramount Pictures for home and theatrical release, and with CBS Paramount Television for TV distribution (most other ancillary rights remain with CBS). Yet ten years later, CBS was talked into another try at Hollywood, in a joint venture with Columbia Pictures and HBO called Tri-Star Pictures. CBS entered the video game market briefly, through its acquisition of Gabriel Toys, publishing several arcade adaptations and original titles for various consoles and computers. (CBS later sold Gabriel Toys.) CBS also entered into the home video market, and joined with MGM to form MGM/CBS Home Video in 1978; the joint venture was broken by 1983, and CBS joined another studio: 20th Century Fox, to form CBS-Fox Video. CBS' duty was to release some of the movies by Tri-Star under the CBS-FOX Home Video label. As William Paley aged, he tried to find the one person who could follow in his footsteps. Over the years any number of accomplished, successful businessmen were recruited, loudly praised to the press, only later to be summarily dismissed. By the mid-1980s, the investor Laurence Tisch had begun to acquire substantial holdings in CBS; eventually he gained Paley's confidence, and then his blessing, taking control of CBS in 1986. But Tisch had no dreams of quality or of "Tiffany" networks; he expected a return on his investment. When CBS faltered, under-performing units were eliminated. Among the first properties to go, and among the most prestigious, was the CBS Records group, which (as Columbia Records in the US and Canada) had been part of the company since 1938. Sold to Sony in 1988, the company which had given the network its name was re-christened "Sony Music" in 1991, and eventually Sony BMG Music Entertainment when merged with BMG in 2004. (Sony purchased from EMI its rights to the Columbia Records name outside the US, Canada and Japan; Sony BMG now uses Columbia Records as a label name in all countries except Japan.) Tisch also shut down in 1986 the CBS Technology Center in Stamford, Connecticut. CBS unveiled its Eye Device logo on October 17, 1951. 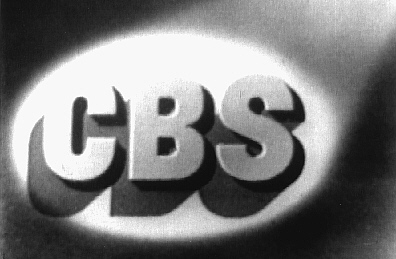 Prior to that, from the 1940s through 1951, CBS Television used an oval spotlight on the block letters C-B-S as its logo. The Eye device was designed by William Golden based on a Pennsylvania Dutch hex sign as well as a Shaker drawing. First drawn by graphic artist Kurt Weiss, it made its broadcasting debut on October 20, 1951. The following season, as Golden prepared a new logo, CBS President Frank Stanton insisted on keeping the Eye device and using it as much as possible. The CBS eye is now an American icon. While the symbol's settings have changed, the Eye device itself has not been redesigned in its entire history. It has frequently been copied or borrowed by television networks around the world, a notable example being Associated TeleVision in the United Kingdom. The logo is alternately known as the "Eyemark," which was also the name of CBS' domestic and international syndication divisions in the mid to late 1990s before the King World acquisition and Viacom merger. In 1995, Westinghouse Electric Corporation acquired CBS for $5.4 billion. Having participated in commercial broadcasting since 1920, Westinghouse sought to transform itself into a major media company with its purchase of CBS. This was followed in 1997 with the $4.9-billion purchase of Infinity Broadcasting Corporation, owner of more than 150 radio stations. Also that year, Westinghouse acquired two cable channels, Gaylord's The Nashville Network (TNN) (later Spike TV), and Country Music Television (CMT). Following the Infinity purchase, the remains of the CBS Radio network was handed to Infinity 's Westwood One subsidiary. 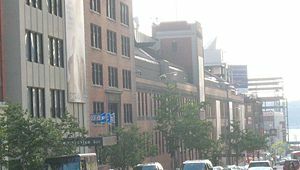 Also in 1997 Westinghouse changed its name to CBS Corporation, and corporate headquarters were moved from Pittsburgh to New York City. To underline the change in emphasis, all non-entertainment assets were put up for sale. Another 90 radio stations were added to Infinity's portfolio in 1998 with the acquisition of American Radio Systems Corporation for $2.6 billion. A year later CBS paid $2.5 billion to acquire King World Productions, a television syndication company whose programs include The Oprah Winfrey Show and Wheel of Fortune. By 1999, all pre-CBS elements of Westinghouse's industrial past were gone. Having assembled all the elements of a communications empire, Viacom found that the promised synergy was not there, and at the end of 2005 it split itself in two. CBS became the center of a new company, CBS Corporation, which included the broadcasting elements, Paramount Television's production operations (renamed CBS Paramount Television), Viacom Outdoor advertising (renamed CBS Outdoor), Showtime, Simon & Schuster, and Paramount Parks, which the company sold in May 2006. The second company, keeping the Viacom name, kept Paramount Pictures (ironically a former shareholder in CBS, see above, also owned a stake in the DuMont Television Network, whose Pittsburgh O&O is now CBS-owned KDKA-TV), assorted MTV Networks, BET, and Famous Music. CBS, Inc. announced on November 3, 2005, that it would acquire College Sports TV (CSTV) for $325 million. The transaction was completed in January 2006. Nielsen ratings estimated in 2003 that CBS can be seen in 96.98 percent of all American households, reaching 103,421,270 homes in the United States. CBS has 204 VHF and UHF affiliated stations in the United States and United States possessions. CBS is not shown outside the Americas on a channel in its own right. However, CBS News is shown for a few hours a day on satellite channel Orbit News in Europe, Africa, and the Middle East. The CBS Evening News is shown in the UK on Sky News, despite the fact that Sky is part of News Corporation (owners of Fox News). In Australia, Network Ten has rights as a CBS affiliate carrying the programs Jericho, Dr. Phil, Late Show with David Letterman, NCIS, and Numb3rs as well access to stories from 60 Minutes. In Canada, CBS, like all major American TV networks, is carried in the basic program package of all cable and satellite providers. As well, many Canadians live close enough to a major American city to pick up the over the air broadcast signal of an American CBS affiliate with an antenna. In 1982, the network aired the documentary The Uncounted Enemy: A Vietnam Deception, suggesting Gen. William Westmoreland deliberately misled the public about the Vietnam War in order to maintain public support. Westmoreland filed a 120 million dollar libel suit that was ultimately settled in exchange for an on-air clarification. However, an internal study found that the documentary had violated CBS News Standards. In 2004, the FCC imposed a record $550,000 fine on CBS for its broadcast of a Super Bowl half-time show (produced by then sister-unit MTV) in which singer Janet Jackson's breast was briefly exposed. It was the largest fine ever for a violation of federal decency laws. Following the incident CBS apologized to its viewers and denied foreknowledge of the event, which was broadcast live on TV. CBS suffered another embarrassment in September of that year, when the network aired a controversial episode of its newsmagazine, 60 Minutes, which questioned U.S. President George W. Bush's service in the National Guard. Following allegations of forgery, CBS News admitted that documents used in the story had not been properly authenticated. The following January, CBS fired four people connected to the preparation of the news segment. ↑ WCBS, WCBS. Retrieved April 16, 2008. ↑ logo, Chuck Pharis. Retrieved April 16, 2008. ↑ CBS to Acquire CSTV, CSTV. Retrieved February 24, 2007. ↑ "The Uncounted Enemy: A Vietnam Deception" Museum of Broadcast Communications. Retrieved February 24, 2007. ↑ "CBS hit with $550k Super Bowl fine", CNN. Retrieved February 24, 2007. ↑ "CBS ousts four over Bush Guard story", CNN. Retrieved February 24, 2007. Barnouw, Erik. 1996. A Tower in Babel: A History of Broadcasting in the United States to 1933. New York: Oxford University Press. CBS – Official CBS website. History of "Columbia Broadcasting System"
This page was last modified on 13 March 2017, at 22:24.